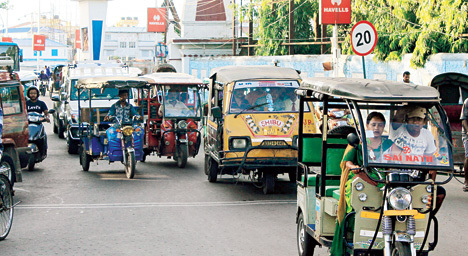 Siliguri: Battery-operated rickshaws, commonly known as totos, continue to run in Siliguri and even on some stretches of highways, slowing down traffic. No less are the diesel-driven city autos, which are running along the length and breadth of Siliguri every day, gurgling out black fumes and even carrying passengers beyond the stipulated number. "We residents are bearing the brunt of these two public transport modes. It is because of unrestricted movement of these two categories of vehicles that we have to face severe traffic congestion and the rise in air pollution. The totos run at lower speed and in most of the streets in Siliguri, particularly in rush hours, a car hardly has a space to overtake a toto. Otherwise, it has to move behind a toto at the snail's pace," said Tanmoy Goswami, an IT professional in the city. Most of the city autos - there are around 1,200 of them in Siliguri - have grown old. "It has been found that most of these vehicles have failed in fitness and pollution tests. Yet, no initiative is taken to replace these vehicles," pointed Pradip Chakraborty, a retired government employee. The ordeal of residents does not end here. On Monday, auto drivers and even some owners resorted to a protest and road blockade, demanding that the totos should not be allowed to ply on key roads. The demonstrators even demanded that the police should not take steps against them if they carry more than eight (the number stipulated by the police) passengers. Last month, the Regional Transport Authority had announced that from August 1, totos will not be allowed to run. This is because the RTA has taken a "sympathetic approach" at the totos, said Krishna Pal, a Trinamul leader and a member of the RTA. "Such a decision was indeed taken and we have informed the toto drivers about it. But we have taken a sympathetic approach at them as they too, have financial burdens and other issues. The decision would be enforced in a fortnight or so," said Pal. The city auto operators, on the other hand, refuse to budge. "If the administration will not control the movement of totos here, it will be difficult for us to control out members from carrying additional passengers in autos," said Nirmal Sarkar, secretary, Siliguri City Auto Operators' Welfare Society. Battery-operated rickshaws, commonly known as totos, continue to run in Siliguri and even on some stretches of highways, slowing down traffic.